hey, yeah that's me. i talked with you at the co-op last sunday. just ran into nad also, later that day. he said he'd be by the co-op soon. If your MTB is 21 speeds I will assume it is a 3 X 7 with a 7 speed freewheel. There are 8 speed freewheels but they're not common. I upgraded my old TREK 820 to a 3 X 9 with an swap to a wheelset with a cassette hub in the rear wheel allowing me to run a 9 speed cassette. Even if your rear wheel is a 7 speed cassette it probably wouldn't accept an 8 or 9 speed cassette. I also upgraded my rear derailleur and changed my shifters to match. I went with Shimano Deore XT but you could use one of their less expensive series. Your existing rear derailleur "might" handle a 9 speed but I wouldn't bet on it. A friend has a Da Vinci tandem, and if I remember correctly, it's basically 10 speeds on the back and 4 on the front, so there's 40. My experience: Mostly use the big ring up front, and only the smaller ring(s) up front towards the low end of the gear range. So really, with a triple on front and 10 speed in back (my Sojourn was that way), there were about 11 gears that I actually used. The others were just there to extend the range, not so much for the extra combinations. Even with that gearing, more often than not, I'd be shifting two gears at a time anyway, as they were really closer together than I needed. If you get a regular bike going below about 2 mph, you tend to fall over, and above a 53:11 or so range, you really can't push it unless you're going downhill or with a tailwind, so there's not a lot of point to the extra gears. dropped some gears (total number anyway), but have a set up i like better. i switched the 7sp freewheel cluster for a 5sp cluster from a shimano front freewheel system. the semi (sort of) fixed gears on the front freewheel cluster keep the trike hub spinning for better shifting (the trike hub is more or less "coasting" like it normally would when i stop pedaling), and since the front front freewheel cluster is still spinning the back chain i can shift the derailleur while coasting too. i've read there's a 6sp version of the cluster, so i could get a few gears back to increase the total number, but i'll have to luck across one. i also like the tricky-ness of it. one chain stops when i stop pedaling while the other always spins. 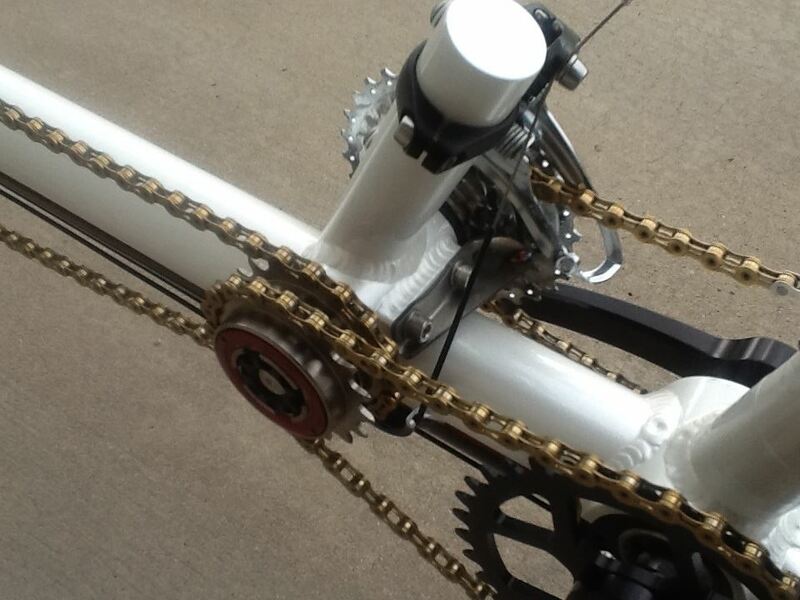 i think if i get to the paint/finishing stage of this bike i'll buy two different color chains for it. so now a 15 speed (that i really like, working out the same set up on one or two other bikes), but it still works as a base for just trying to max out the gear numbers. like a triple chain ring on the front with a tensioner, or finding the sram internal/freewheel hub. the crazy multigear burrito is still a festering idea if i luck across some extra parts. It's possible to get four on the front, twelve on the back, and four in a hub. That gives you 192 gears. But you could times that by four, using a tandem, by using a leading four. The stoker's pedal arms would have to be removed, as the rear crank would turn out of sync. Still, that'd be 768 speeds. More if you can get more in the hub, but i don't know of one that'll go in a cassette carrying hub, perhaps the old Sturmey 5-speed goes in the generic shell. Maybe a cassette could be adapted onto an Alfine 11-speed. You'd be looking at the possibility of circa 2,000 gears. My tandem has the 'armless crank' on the rear, but the leading crank is a single so no added gearing. In fact it's just 2x10 speed, as making a high number of gears wasn't on my agenda. However, i have a final drive on it, making those 2x10 gears longer than the tooth count suggests. This as the front ring is 38t and it pulls the 30t granny ring on the rear triple. The most gears i ever had was 81, using a 9-speed cassette on a 3-speed hub, with a triple up front. a different bike, but i have a pic of it i can get to, and it has the start of the same set up. 3sp trike hub where the two chains meet, and a 5sp shimano front freewheel cluster on the wheel. not considering possible gear duplication, it's a 15sp. i've put this setup on three of my cruisers, including my favorite at the moment. if the goal was to end up with as many gears as possible, there's a 5 speed version of the trike hub (or the most i've seen anyway, could be one with more), and i could go with a wheel made to take one of those 11speed clusters (not sure of smooth shifting of the trike hub if the cluster isn't somewhat "fixed" like the shimano cluster is) on a sram dual drive hub, if it would take an 11, might be limited to 9. i could also add a triple ring crankset with a tensioner at the hub. but like i said before, the most gears wasn't the actual goal. but if i ended up with the parts (like i lucked into an 11speed wheel over the summer) and an idea for probaly a crazy burrito bike, i might try it. One to five in hub for me max! then you calculate the gear ratios and eliminate the redundancies and those with range overlaps and see just how many different useful gear ratios you have left..